With school out and the temperatures dropping, the winter holiday season is the perfect occasion to stay inside, pull out the craft supplies, and spend some quality time around the table with your kids! 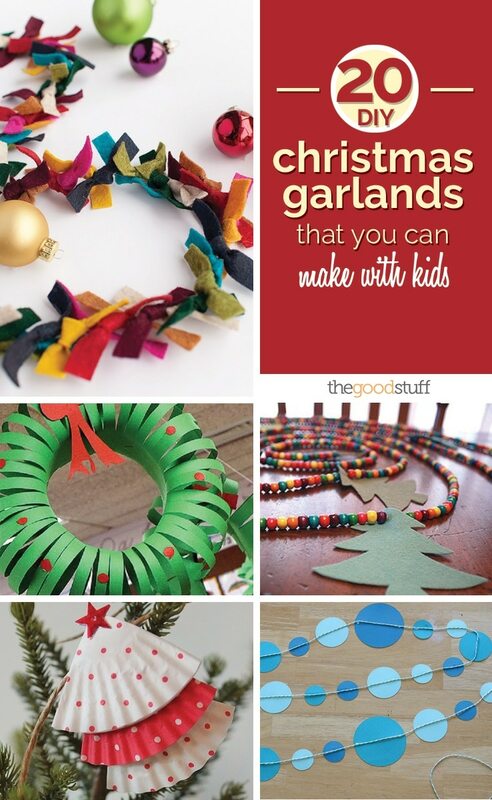 What better way to keep the kids occupied than to have them help craft up some festive décor for around the house? 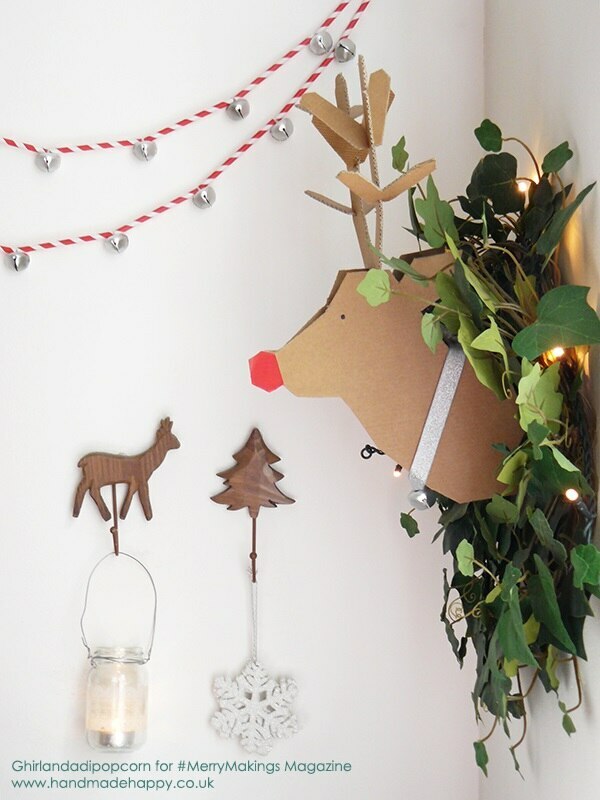 Check out these 20 creative tutorials for crafting fun and festive DIY Christmas garlands perfect for around the tree, down the banister, hung from the ceiling or even just taped on the wall! 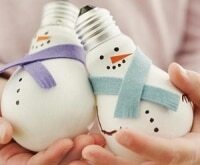 Using paper plates and paper scraps, encourage your children to give each snowman a unique personality. 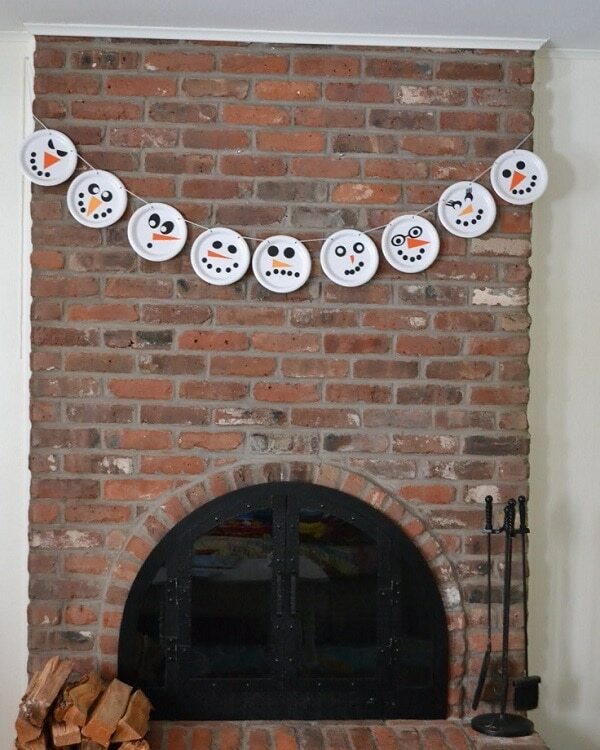 String them all together and display your snow family for all to see. 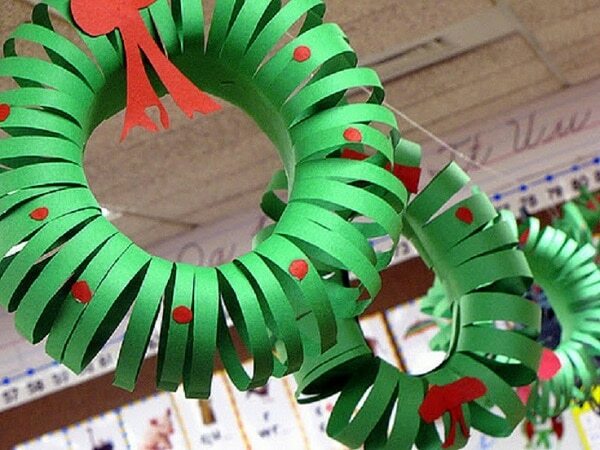 Construction paper cut and glued into festive wreaths look adorable on their own or can be strung together for a grander effect. 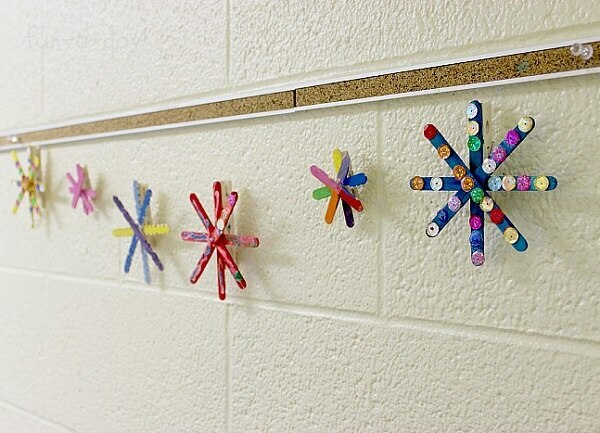 There are endless ways to decorate popsicle-stick snowflakes: paint, buttons, beads, rhinestones and more! Use clear fishing line to connect the snowflakes to give the appearance they are drifting through the air. Turn on a holiday movie, snuggle up on the couch, and string some pom-poms on twine to make this classic holiday garland. 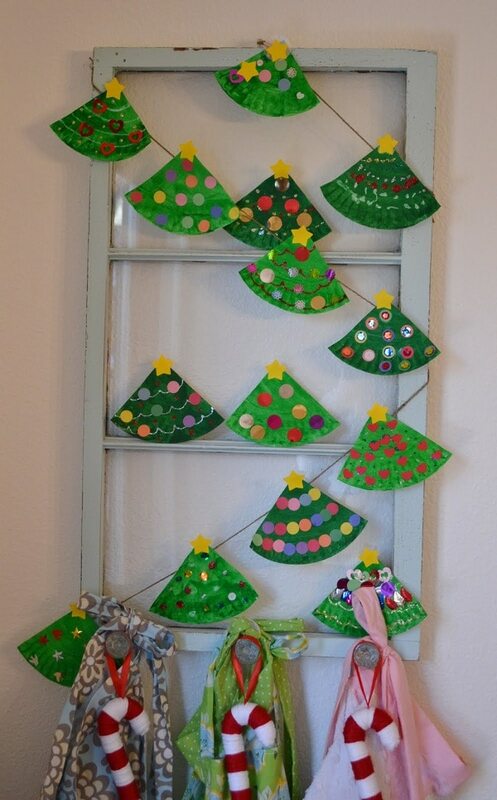 Once painted green, paper plates make adorable Christmas trees. 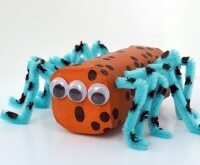 Let the kids go to town adding paint, stickers, glitter and more to personalize each one! 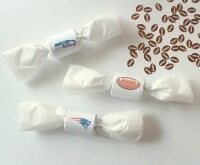 Nothing says ‘Christmas’ more than candy-canes and peppermints! 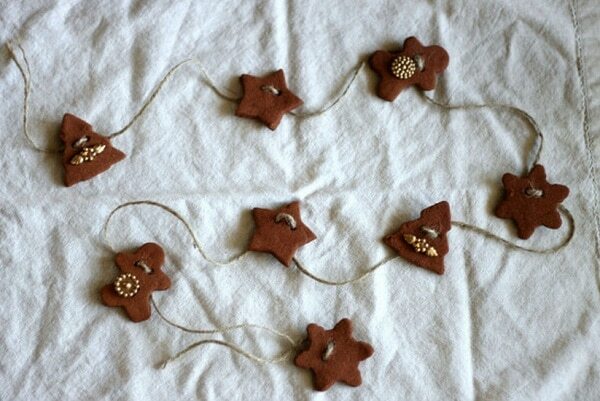 Turn pinwheels of felt into peppermint candy look-a-likes for a whimsical addition to your décor! 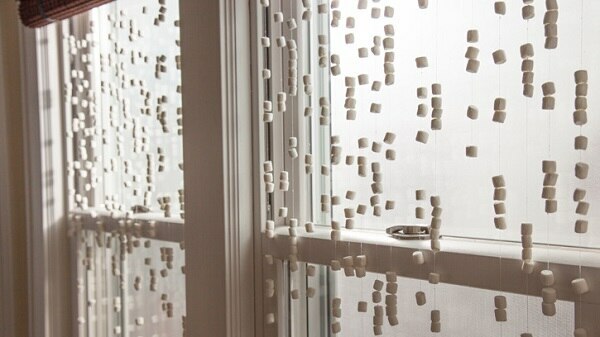 There is no better way to bring the snowy outside in than with plump and pillowy marshmallows. 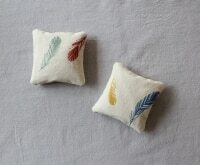 Around the tree or hung in the windows, these will surely make your home feel like a winter wonderland! 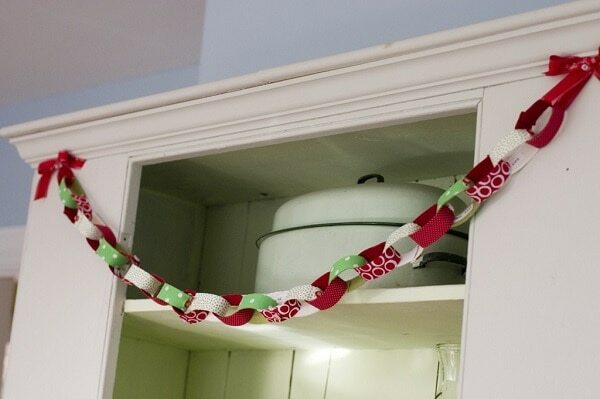 Made of fabric scraps and Velcro, this garland is an updated take on a traditional childhood craft! 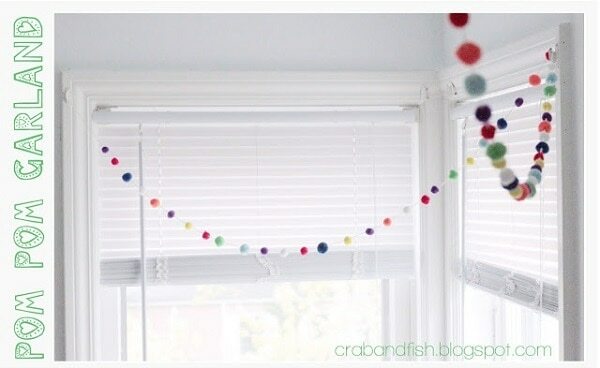 Merry-colored gumballs make for a sweet and modern garland! 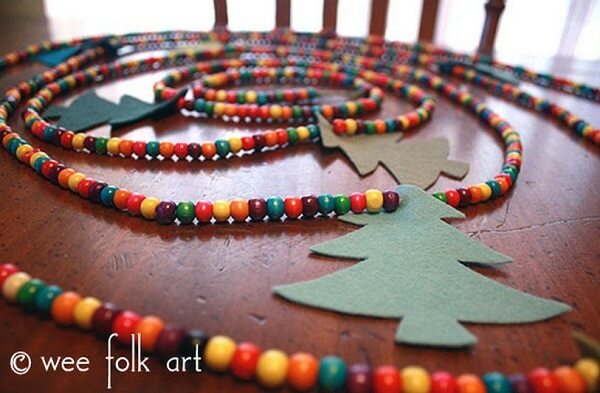 Paint or buy wooden beads and string them all together in a random pattern. Make it extra long to wrap around the tree multiple times, bringing texture and color to every branch! 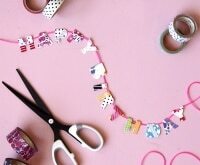 Sewn or glued onto string, paper circles combine to make a perfectly simple and festive garland that can be used any time of year! 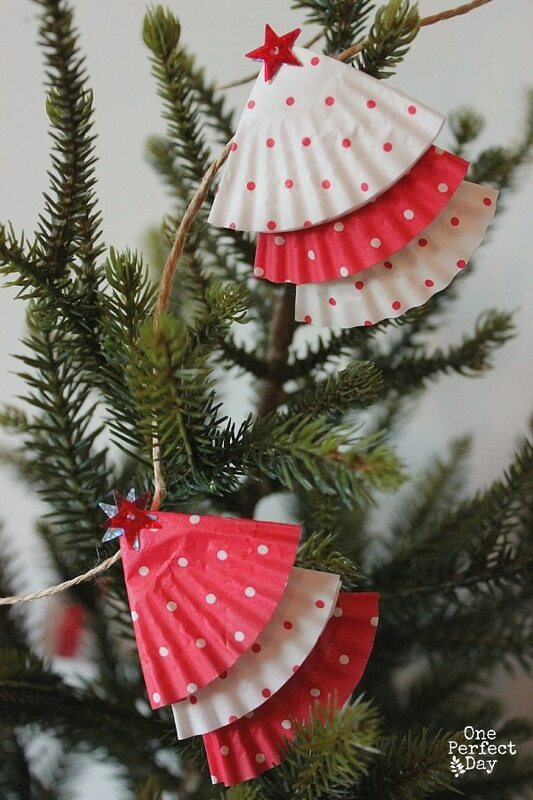 Cupcake liners folded and layered make for whimsical and delicate mini trees. 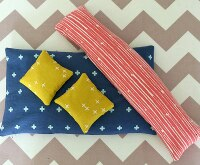 String them through the tree branches for unexpected pops of color and texture. 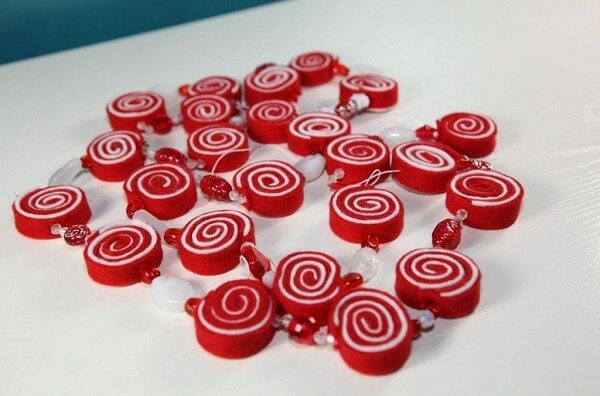 Red and white straws are strung together with jingle bells to make this quintessential holiday accessory. 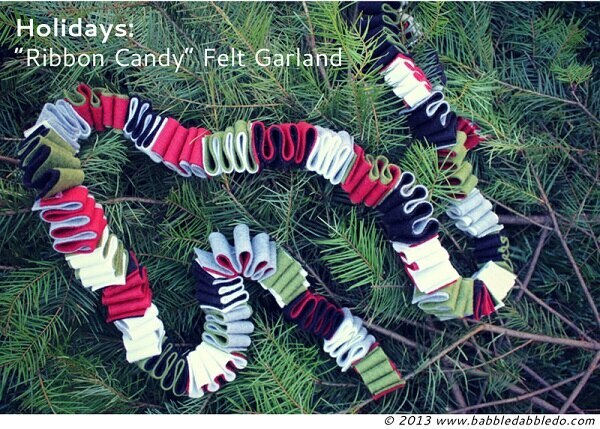 Re-create the look of traditional Christmas ribbon candy with felt and thread. 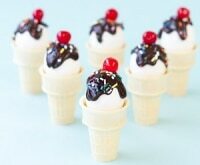 It looks almost good enough to eat! 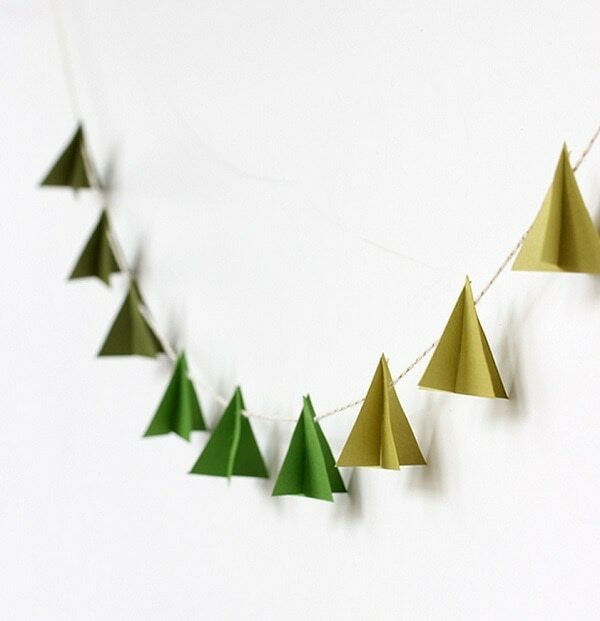 Ombre-colored paper triangles are simply cut and slid together to create and ultra-modern display. 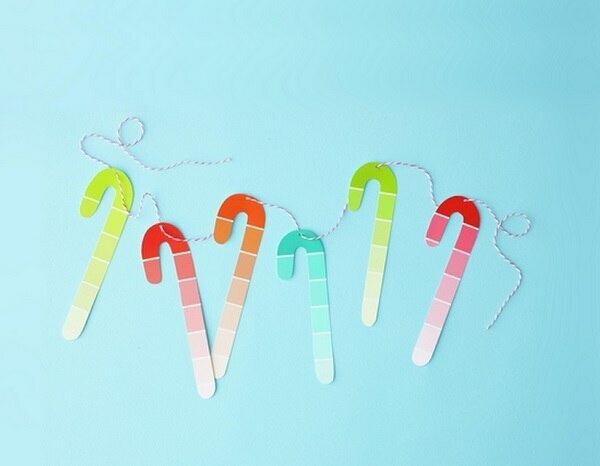 Snag some paint chips the next time you’re at the hardware store, and let the kids trace and cut holiday shapes for quick and easy décor! 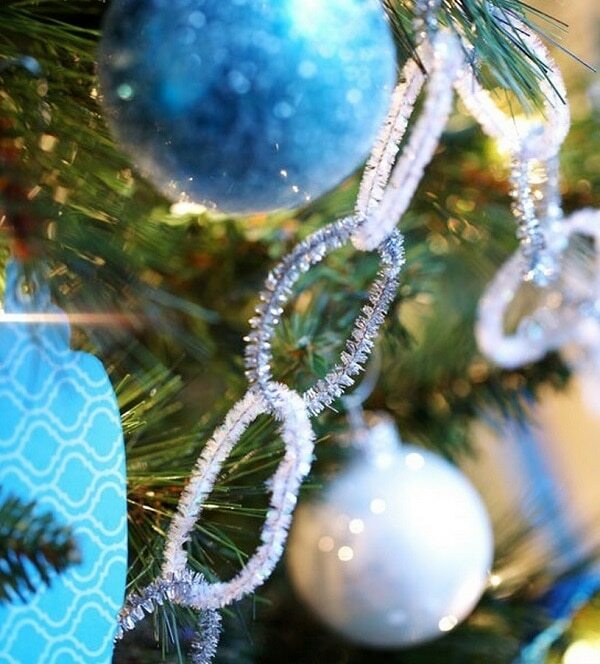 It doesn’t get much cheaper or easier than pipe cleaner loops inter-connected around the tree! 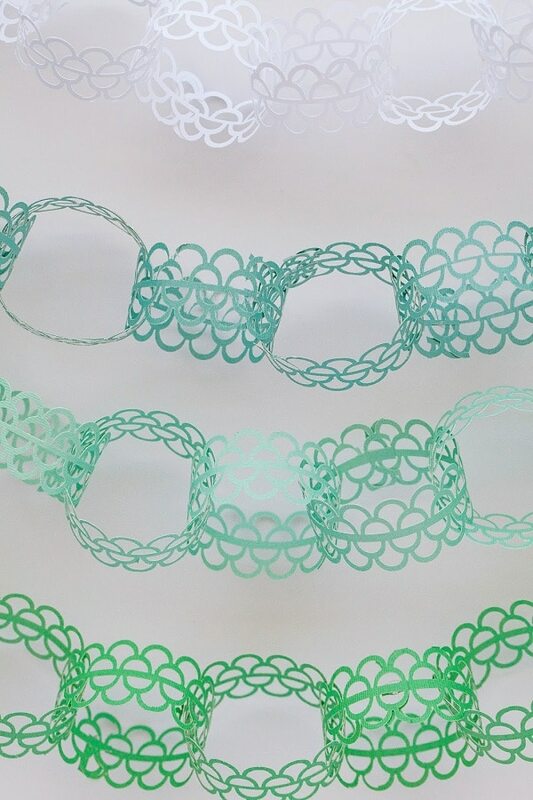 Use sparkly pipe cleaners for a more festive look! 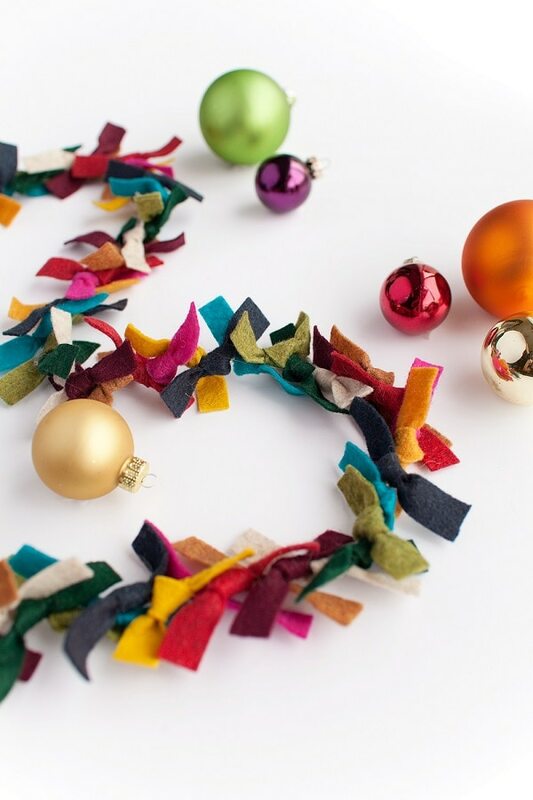 This DIY take on a high-end garland is easy as cut and tie, resulting in a garland high on texture, color and style! 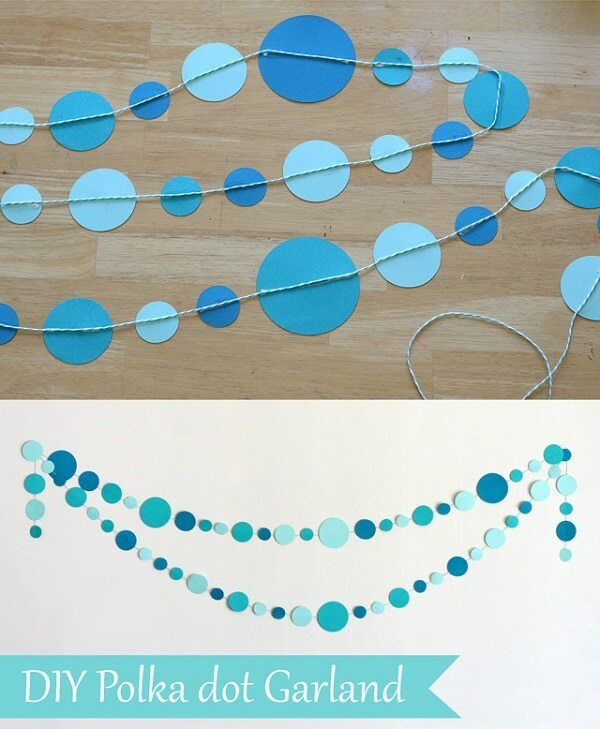 This gorgeous paper garland is easier than it looks. 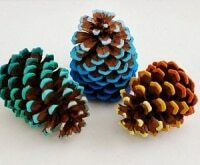 Let the kids play with a punch and pretty paper to yield amazing swags for your tree! These ornaments smell as good as they look. 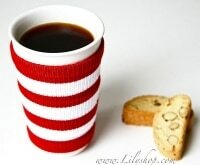 Combine this baking activity with craft time for a sweet-smelling classic touch to your tree!